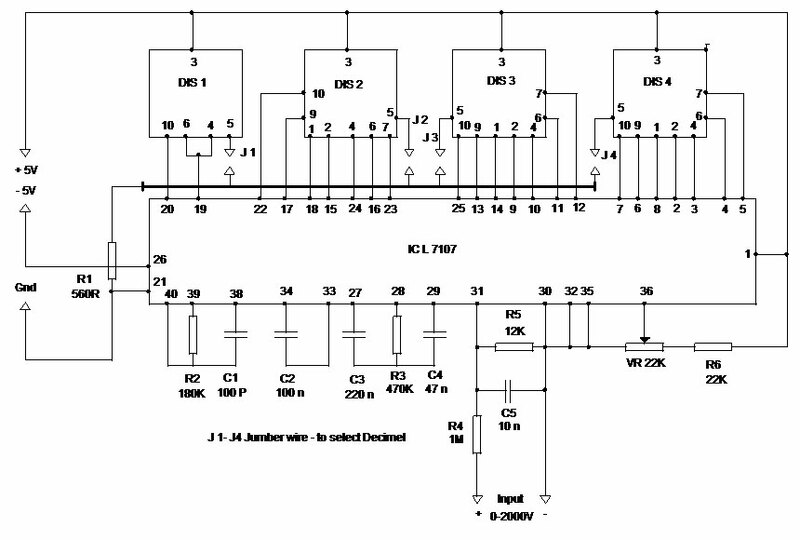 With a single IC L 7107, you can make a 4 digit voltmeter that can show 0-2000 volts through seven segment display. The circuit is low component one and the reading is reliable and accurate. This circuit is used in digital panel meters to give alpha numerical display. The whole circuit is built around a single 40 pin IC L 7107.It is an Analogue to Digital Converter (ADC) IC from Intersil. The whole circuits for converting analogue signals to digital signals and the seven segment display driver circuit are enclosed in the package of IC. The circuits inside the IC are AD converter, a comparator, a clock, a decoder and a display driver. The IC works in 5 volt dual power supply and consumes less than 200 mA current and shows an accuracy of 0.1 %. The IC is CMOS and is very sensitive to static electricity. It comes wrapped in aluminium foil to protect it from static discharges and it should be handled with great care to avoid damaging it. Try to avoid touching its pins and keep the circuit and the body at ground potential while inserting it in IC base. Stage 1– During the stage 1, the input voltage given in the integrator which gives a voltage proportional to the input voltage. 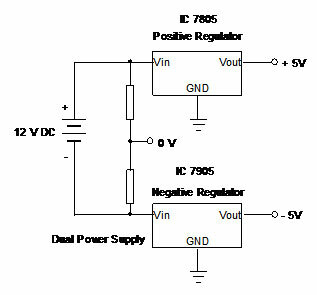 The integrator is fed with an internal reference voltage and the output of the circuit reduces until it reaches a zero reference voltage. Stage 2 – This stage is the Negative Slope period which depends on the output from the integrator. As the duration of stage 1 is fixed, the length of the stage 2 is variable making possible to compare the input voltage with the fixed reference voltage. The result of this comparison is then coded and send to the decoder and then to the display driver. The operations of stage 1 and 2 takes place with the help of the external components connected to the IC. The voltage to be measured is applied across the input points of the circuit and through R4, R5 and C5 and is finally applied to pins 30 and 31 of the IC. The resistor R2 together with C1 is used to set the frequency of the internal oscillator (clock) which is set at about 48 Hz. At this clock rate, there are about three different readings per second. The capacitor C2 which is connected between pins 33 and 34 of the IC has been selected to compensate for the error caused by the internal reference voltage and also to keeps the display steady. The capacitor C4 and the resistor R3 together does the integration of the input voltage and at the same time prevents any division of the input voltage making the circuit faster and more reliable as the possibility of error is greatly reduced. The capacitor C3 forces to display zero when there is no input voltage. The resistor R6 together with VR is used to adjust the circuit during set-up so that it displays zero when the input is zero. The resistor R1 controls the current that is allowed to flow through the displays so that there is sufficient brightness without damaging them. The whole circuit operates from a dual supply of 5 DC which is applied at pins 1 (+5 V), 21 (0 V) and 26 (-5 V) of the IC. After soldering all the components, double check for any shorting or dry joints and then connect it to the dual power supply observing polarity , +V,-V and 0 V. The displays should light immediately and should form a number. Short circuit the input (0 V) and adjust the VR until the display indicates exactly 0000. 7 Segment display should be Common Anode type. Is this panel meter require separate power supply 5V from metering voltage and why? For metering voltage above 5V. The panel meter circuit requirs 5 volts only. Separate power supply is needed.Metering voltage is diffrent and do not tap current from the testing voltage source. If the voltage increases, it will damage the IC but you can give 0-2000 volts in the input since there is current limiter resistor in the input. I know Ic needs 5V. And i dont know why is problem for almost all panelmeter to meter voltage of power source and from this power source get power of 5V. Why panelmeter cant use the same power source to supply panelmeter with appropriate voltage and meter the same power source? MICRO INSTRUMENTS & CONTROL SYSTEMS – PROCESS AUTOMATION SYSTEM, BOILER PLANT AUTOMATION, SIGNAL ISOLATOR, DIGITAL PANEL METER, PLC CONTROL PANEL, BOILER AUTOMATION SYSTEM. Hi mohan sir.. Is the IC available in kerala?